As the ending of 'Burning Fields' nears, Aban and Dana have to survive an onslaught of zombies and prepare themselves to take on Decker to avoid a cataclysmic event. It's a white knuckle beginning to the penultimate issue as it slowly transitions to an existential discussion and a revealing Dana backstory. 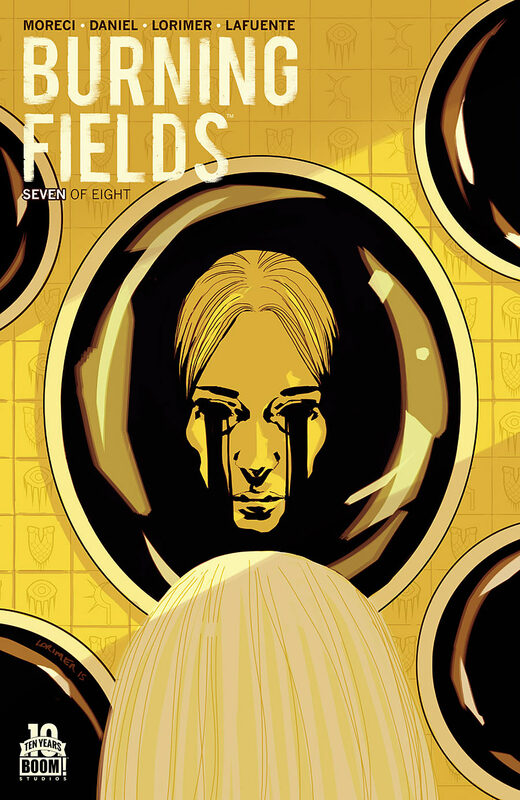 It's these type of ebbs and flows in the storytelling that feeds your more primal needs for action and violence countered with deeper interactions between characters that have made 'Burning Fields' the best drama in comics. You can keep your 'True Detective' (although writer Michael Moreci is one of the handful of people who enjoyed it) and its pseudo-pulp word salad and I'll take Moreci and Tim Daniel's more thoughtful and deliberate approach. During the quieter scenes between Dana and Aban, there's the type of reflective and sober dialogue that feels right going into the final issue, the final battle. Decker is hellbent on releasing Asag onto the world and both our heroes are resigned to the fact this could be their end as well. Their approach is totally different though. As always, Aban is calm with his zen-like demeanor realizing the magnitude of what's ahead but at peace with it. Dana on the other hand, is virtually reckless in facing this terror head-on and achieving justice at whatever the cost even her own life. She implores Aban that he should remain with his family, that it's not his fight. After the chilly reception from Aban's wife at their home I imagine she'd be just fine letting Dana go it alone. Aban is too honorable and resolute to let that happen. 'Burning Fields' is about a lot of things but at its center it's about these two very different riveting characters. I've been praising the artwork from Colin Lorimer and colorist Joana Lafuente throughout this series and I can't help but gush some more. The Walking Dead-style opening was ghastly and intense. The choices in perspective gave it the scope it needed to enhance the terror. Lorimer and Lafuente could have a career on straight horror alone, but few others can excel at what they do in keeping a heavy atmosphere page after page. The dark theme materializes in heavy shadow work and silhouettes. It's as though the darkness is literally and figuratively surrounding Aban and Dana, virtually swallowing them whole as the series has gone on. The stage is set for the grand finale and we'll see if Dana can find redemption and revenge without losing her soul. It should be a pulse-pounding ending to one of the smartest and exciting thrillers in comics today.